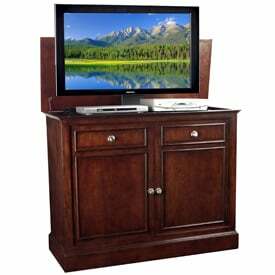 Our Traveler TV lift cabinet is a true beauty! It features beautiful select hardwood in a rich tobacco finish. The Traveler’s rich tobacco stain is complemented with brushed nickel hardware creating a clean transitional look sure to work in any room. This TV lift cabinet offers a center lift unit directly below your TV to store two electronics with depths of 13 ¼” or less. It features a surge protected onboard power for your TV and two components. The Traveler can also accommodate most flat panel TV’s as large as 46”. Plus we offer free white glove delivery! Check out the Traveler TV lift cabinet today!